Is there a solution? Well, simply invest in the best pole saw if you love accomplishing such tasks by yourself. While doing so, you don’t have to be hanging precariously on a ladder or have to climb the tree itself. 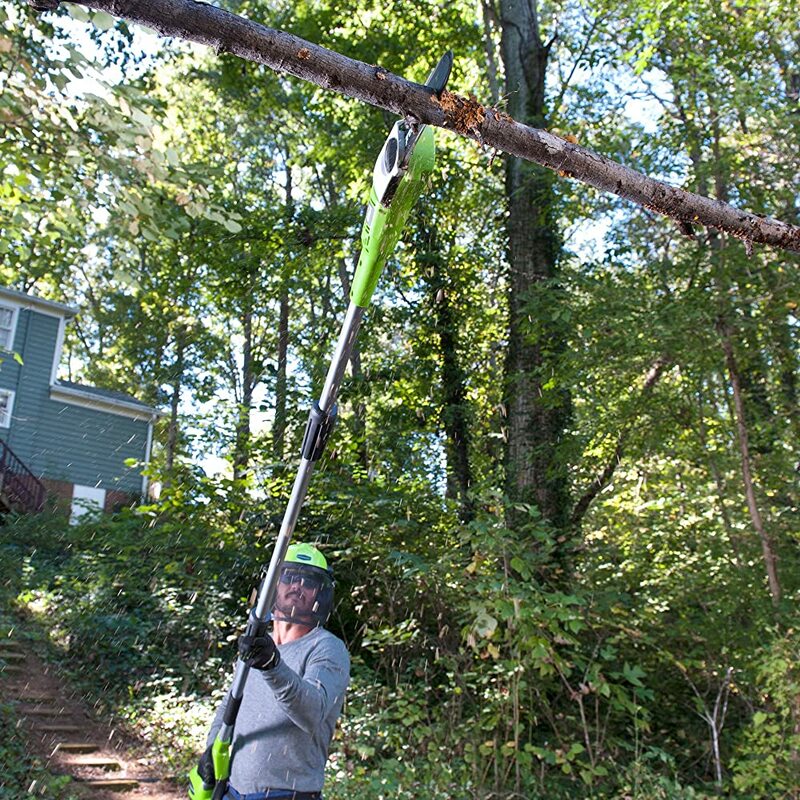 With pole saws, you remain rooted on the ground as you complete this task. If you haven’t invested in one yet, or you are looking to replace your old one, this buying guide will come in handy in helping you make the best choice. A pole saw is a smaller sized chainsaw attached at the end of a pole, just as the name suggests. The pole (telescopic as it is referred to by some people), is meant to extend your reach while keeping you on the ground. In this way, you can trim, hedge or prune tall trees with their branches high up. By attaching the light chainsaw to a pole, the need for a ladder is eliminated and this will keep you safe in the process. The pole also serves as the control center for the saw by housing the buttons and trigger. To fire up the saw, simply squeeze the trigger. Once up and running, use the pole to maneuver the saw from one tree branch to be eliminated to the other. The fact that a pole saw is a good tool for gardeners is an undeniable one. It makes the work a lot easier. However, choosing one is always not so easy. There are a lot of different options available from which you will have to choose from. The different types available can confuse anyone, given that they all have their strengths and weaknesses. Let us take a look at what types you should expect, and the probable pros and cons of each for an easier decision making. Just like any other gas-powered tool, gas pole saws are among the common types that exist in the market. As the name suggests, these use gas as the powering fuel. 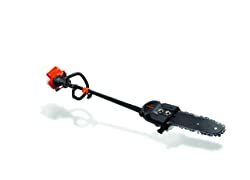 With this, they provide you with the best performance if your garden is large and has lots of trees that need pruning. This type is also the best choice for professionals who give preference to the amount of power a saw produces. They can operate for extended periods, provided you maintain them well and keep their gas engines filled. Therefore, if you prefer power to other factors and don’t mind the noise, then these could be your best option. They are also well suited for large yards with numerous trees to work on. These are also called corded pole saws. They are a lot different from the gas pole saws as they use electricity to run instead of gas. This means that they are quite powerful. But unlike the gas types, they weigh less and produce less noise (or none at all). If you get an electric pole saw with a 6-8 Amps rated motor, it should tackle considerably thick branches with relative ease. Their probable downside is the presence of a cord that you will have to drag along, limiting the size of the yard to work on. This cord also limits the distance from a power outlet in which you can trim. But, you can always add more cord length if need be. The weather also works against it and may prevent your hedging plans. These types provide an ideal solution as they eliminate the cord. They are powered by a battery that can be charged, used, and when the power runs out, it can be recharged and you continue working. Such saws provide for the convenience of taking them anywhere and the benefit of eco-friendly electric power. The choice of the one you buy will depend on the size of branches you will be working on, as this influences the battery to choose. 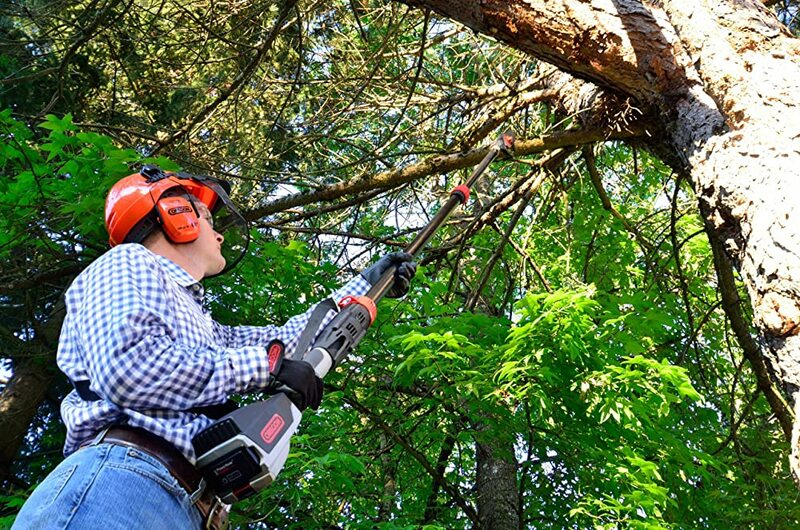 Cordless pole saws come in a variety of 20 or 40 Volts batteries, with the latter being more powerful. Their downside is the limited battery life as the batteries will run out, though the batteries have been improved with newer Lithium-Ion battery models. They are also slightly heavier than the electric pole saws as well as being less powerful. The manual pole saws are the old-fashioned type of saws that were used before the discovery of electric or gas saws. These are the types that gardeners used back then and even until now to tackle high growing tree branches. A sawing part is attached at the end of a long pole that requires the manual efforts to operate. With this in mind, they are not very convenient in pruning large branches and trunks. However, if you need a tool for your occasional tree branch trimming, then you might want these. Affordability is another advantage as they are the cheapest here. To give you a heads up when setting out to buy a pole saw, we will do pole saw reviews of some of the best products currently available in the consumer market. We hope this review will help you get a clear picture of the saw to settle on. 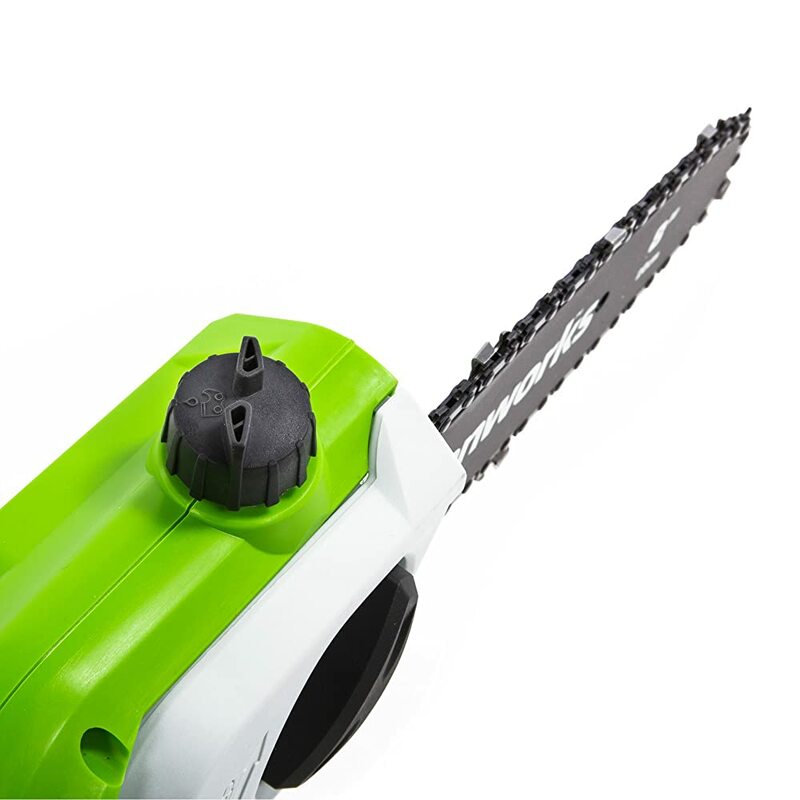 The Remington Electric pole saw is a 2-in-1 power tool that is a combination of a pole saw and an electric chainsaw. 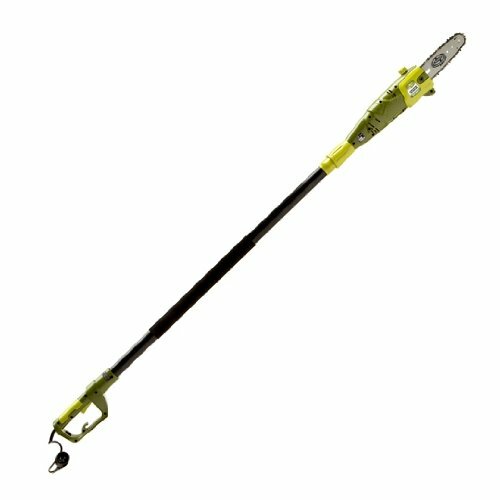 This makes a good option for your tree limb trimming and cutting needs, especially in the hard to reach places. This saw has an 8-amp powerful electric motor which is responsible for driving the saw chain. 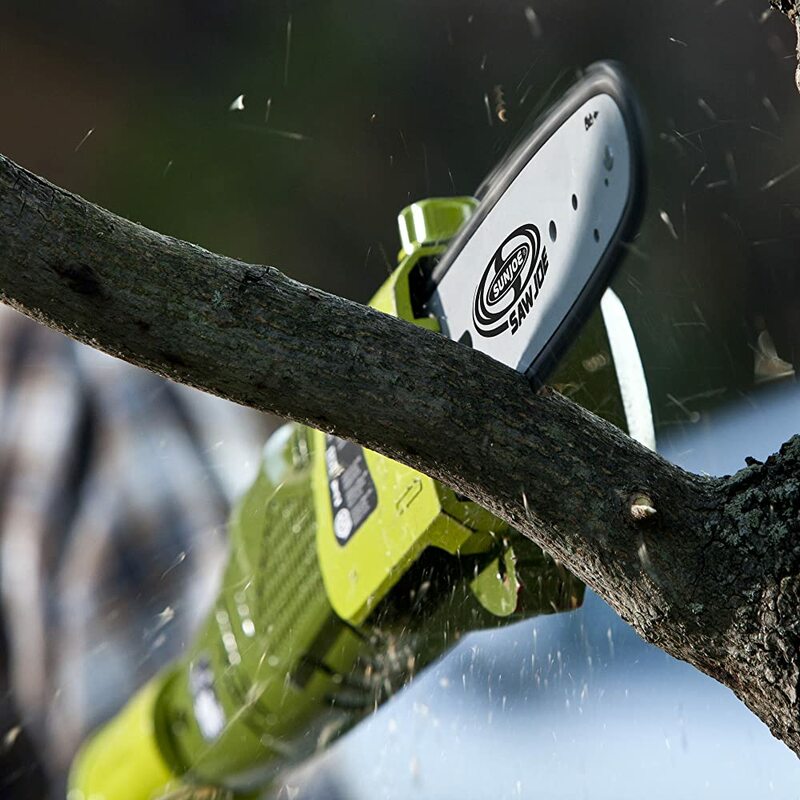 It makes for a great feature as it allows you to trim even relatively sized tree branches. 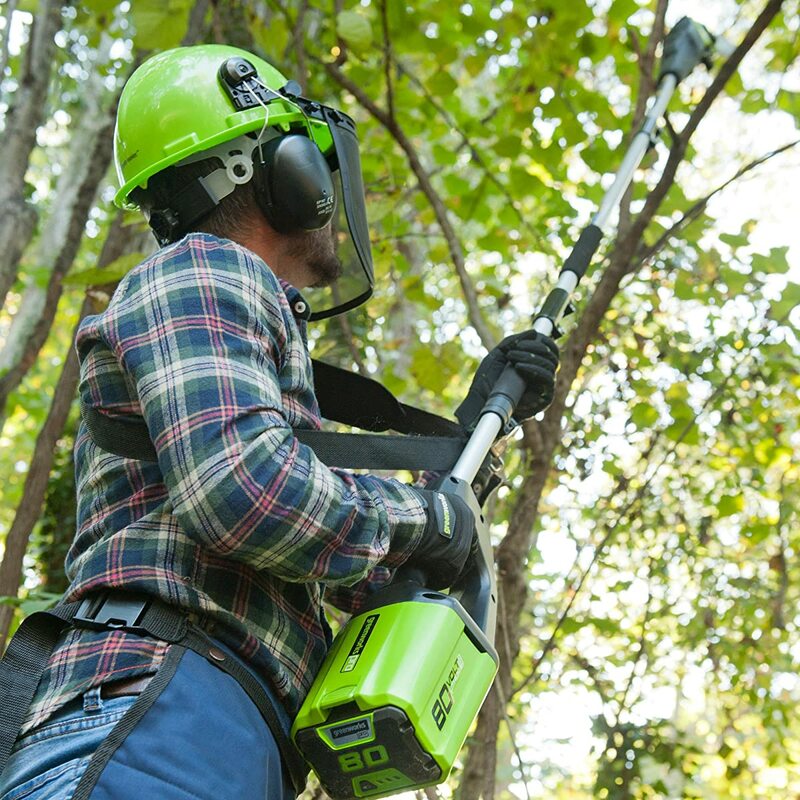 When on the ground, the pole allows you to trim overhead branches as high as 10 to 15 feet high. Another good feature is the ability to detach the pole within a very short time without using the tools. This can help you save time when working especially when you need to change from a pole saw to a chainsaw. 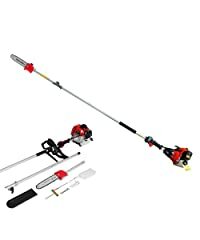 If you want a pole saw that would not rotate once you have extended the pole, then this is a good option to start with. The pole is designed such that it is rotation free and has a non-slip grip for more comfortable use. The Sun Joe electric Saw is another great option that you might consider if you are looking for a pole saw to trim the overgrown trees in your yard. 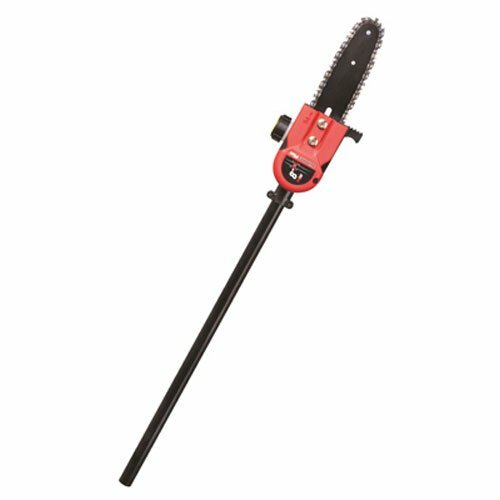 This pole saw is fitted with a robust 6.5-amp motor which powers the chain fitted on an 8” Oregon bar. The motor fitted on it is then able to drive the chain at a no-load speed of up to 6,000 rpm. 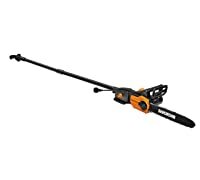 This pole saw also has a telescopic pole which is a good feature if you want a height that you could tailor to meet your specific needs. The height can be extended by 8.7 feet to provide a reach of 15 feet. Another good feature is the automatic oiling ability. This feature is great because it keeps the chain and bar lubricated at all times when in use. This is a deviation from having to press a button to lubricate the chain. To start the saw, you only push a button. This is ideal if you want to avoid the hassle of starting a gas pole saw. Another great feature is that a safety switch that prevents any accidental starts has been included in its construction. 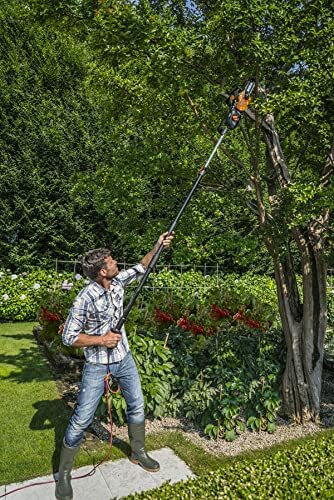 The Worx Electric Pole Saw is a 2-in-1 sawing tool that is great for your tree branch munching errands. If you want to be able to work overhead or on the ground, then you might give it some consideration. 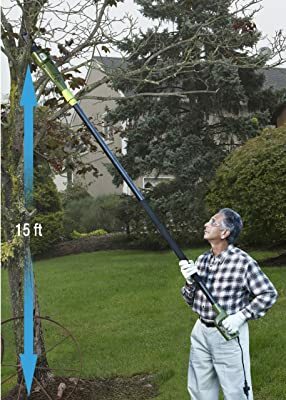 An 8-foot extension pole is provided so that you reach the elevated branches, which is great when climbing ladders is a daunting ordeal for you. The 8-foot extension extends the total overhead reach to 10 feet, which quite impressive. When on the ground, you simply remove the pole and use it like a chainsaw. This product has a powerful 8-amp motor that sheds most of the weight on it, which is great because it lessens the burden on your hands as you raise it. Another good feature is the auto-tensioning and auto oiling of the chain. This increases the service life of the pole saw. A 120-ml oil tank keeps the moving parts in top condition for prolonged usage. 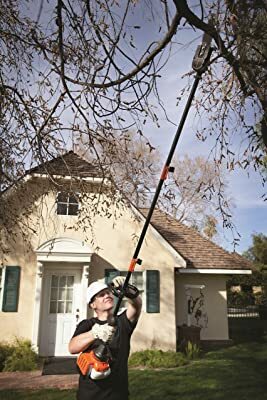 The Remington Gas Pole saw is a gas pole saw that is powered by a 25 cc, two-cycle engine that delivers plenty of power for dealing with stubborn limbs. This engine is great if you have numerous trees in a large yard that need pruning. The engine then delivers power that is transmitted to the 8” long bar and chain for cutting. This cutting system is then attached to a 7 feet long extension pole that increases your reach to 12 feet. Such a feature is great if the branches that need working on are higher up. A 2-segment steel pole design allows you to work at a variety of heights. Better still, one of the segments of the pole can be removed if you would like to use the saw for ground lambing or sawing with a shorter configuration. This pole saw has an automatic oiler which always keeps the chain lubricated properly at all times. You will fancy this feature if you mind having to push a button to lubricate the chain before cutting. 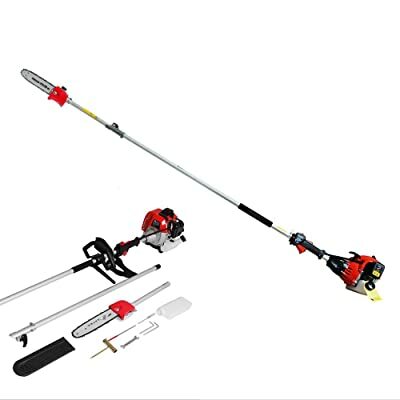 The TrimmerPlus is a multipurpose garden care tool that converts to other tools with the connection of other attachments. This versatility is great if you are looking for a tool that you can use for other purposes as well. Another good feature is the inclusion of an auto oiler that constantly supplies oil to the chain and more. This mechanism, therefore, eliminates frictional forces which heat up these moving parts if unchecked thereby prolonging the product service life. A 2’’-height extensible saw pole is mounted on the other end of the 8” bar and chain, which adds 7 feet to the total height. In return, the saw is capable of reaching heights of 12 feet depending on the user height. This feature is great if you are a tall user because reaching the highest branches will not be a problem. With such a height, you would not need a ladder or climbers to make your trees neat. 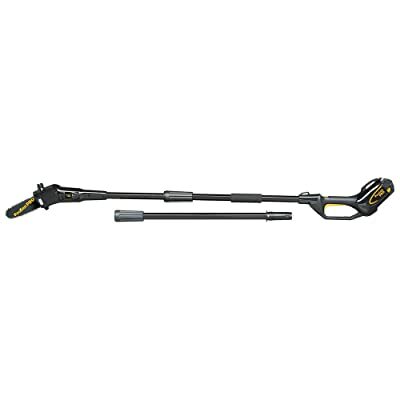 The Maxtra is a 42.7cc, 2-cycle gas powered pole saw that finds a lot of uses in your yard. This particular feature could come in handy when you are looking for a tool that can trim, log, prune and cut wood with ease on your garden. The almost 1100 watts of energy produced by the engine is transmitted through the adjustable pole. You can adjust the pole from a height of 8.2 feet to 11.4 feet. To add to this height, the chain measures about 10 inches, meaning that you can cut branches at heights of 13 to 16.5 feet depending on your height. This height is without climbing any ladder of course. This gas pole saw features an ergonomic design which is great for comfort during your routine usages. An air filter is included in the engine for much cleaner combustion hence fewer fumes. To make starting it an easy task, a centrifugal clutch is used instead of the normal types. Another great addition is the muffler shield which is a plus as it prevents you from coming into contact with the hot muffler. 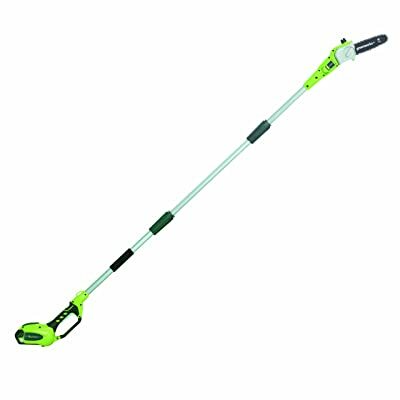 A 40 Volts G-MAX Lithium-Ion battery system powers this Greenworks Cordless Pole Saw, which is great especially if you are trying to get a tool to last you long on a single charge. Included in the setup are the 2Ah battery and a charger. The Lithium-ion battery greatly reduces the overall tool weight, with the saw weighing just 8.360 pounds. Such a weight reduces the burden of carrying the saw, more so when working at elevated heights. The power produced by the battery is then used to drive the 8” bar and chainsawing system. This bar size is sufficient to cut through most of the smaller sized branches without drawing too much power from the battery. An easy to adjust tension system quickly tightens or loosens the chain. This ensures optimal chain life. Also, an automatic oiler lubricates the bar and chain to ensure friction is greatly reduced. Another good feature that this product has is the aluminum shaft that comes in 3 pieces. These pieces enable the pole saw reach to be extended by 8 feet, which is great for an extended reach. 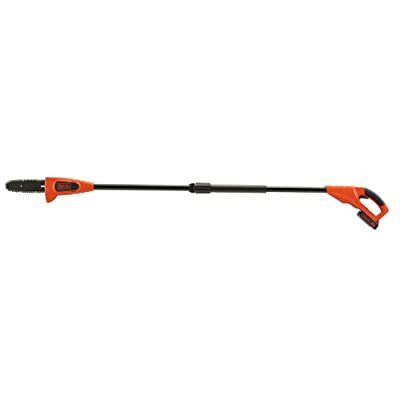 A 20 Volt MAX Lithium-Ion battery powers this Black+Decker cordless pole saw. This battery type is great as it extends the charge retention and lifespan of the pole saw. Ideally, it should be able to last you about 100 cuts when working with 1 ½” branches of pine on a single charge. 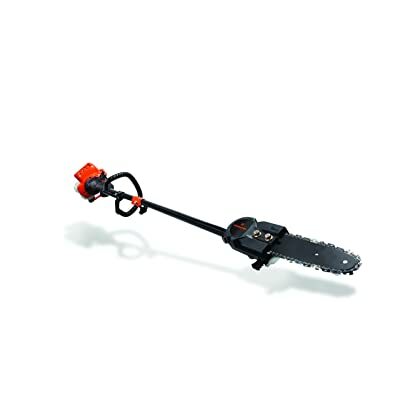 Since it is fitted with an 8” cutting chain and bar, the saw can tackle maximum branch diameters of about 6”. This diameter is great if the branches are considerably thick in your yard. You must realize that the thicker the branches you prune, the faster the power runs out. The pole mounted on this saw extends the reach by 6 ½ to 10 feet. In the process, the overhead reach is increased to 14 feet depending on the height of the user. The Poulan Pro is a cordless pole saw that features a 40 volts Lithium Ion battery, which is an advantage as it provides a long runtime without producing fumes. To get the pole saw running, a push button is provided so that you start working as quick as possible. An ergonomic design ensures that you remain comfortable as possible during the operation. The weight is considerably reduced as well as the noise levels. The handle is made of over-mold grip for a comfortable grip. A convenient chain tensioning mechanism is located within reach so that at all times you are using the right tension. In the process, the chain neither loosens nor binds to the guide bar. Additionally, an auto oiler is included in the design with an indicator for the oil level. With the pole, your reach is extended by about 8 feet. This makes for a good overhead working height. The need for a ladder is therefore eliminated. Ordinarily, yardwork is not an easy one as such, although this depends on who you ask. However, all ease changes when the task has to be taken off the ground. Trimming those tree branches is necessary, but you will be venturing into the very dangerous territory. What if you could do all these while remaining stable standing on the ground? Yes, you can achieve that with the pole saw. Here are some of the reasons why you should invest in a pole saw. Climbing trees using a ladder or using any climbing equipment is quite scary for some of us. This is particularly when you have to operate a chainsaw while dangling up there. With a pole saw, you do not have to go through all that. With one of these, you can comfortably perform all the gardening tasks on your own without needing the help of a professional. And as pole saw’s technology becomes more advanced, you get longer lasting batteries and less weighing cordless tools that are more convenient. If you have ever used a chainsaw before, you might have experienced the not so comforting vibrations despite the spirit efforts to minimize these. These vibrations are considerably reduced in pole saws. The pole has vibration absorbers that make for comfortable working. Another issue is their lightweight nature. It makes reaching high places a lot easier hence extending your working hours. Of course, the different types will weigh differently, but the general rule of thumbs is that they weigh less than the actual chainsaw tools. 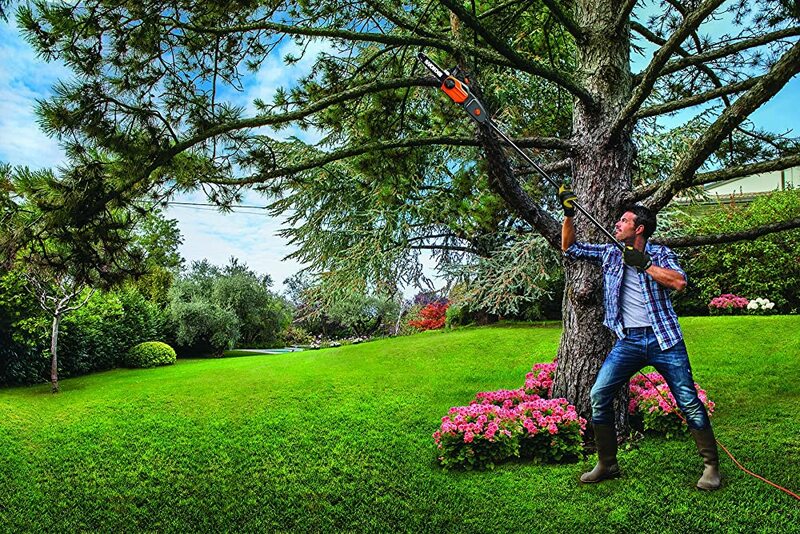 With a pole saw, you don’t have to hire anyone to do your gardening tasks for you. This, in turn, saves you lots of bucks. Well, the tools may require occasional maintenance. But the maintenance fees do not always cost much. In matters cost, despite the high level of convenience these tools afford you, they remain to be relatively affordable. With the kind of service you will be getting, this is a good value for your investment considering how expensive it is to hire tree pruning services. This reason is subjective and depends on the user and the type of pole saw you are using. The gas pole saws are a little complex to use, with the electric pole saws and cordless pole saws being the easiest to use. To operate these, you simply push a button and the saw roars on. And then all that remains is just directing it to the branch you want to be cut, and it does the rest. Sounds easy and fun, right? Imagine having to climb up a tree to cut its unwanted branches using a ladder or any other climbing device. How scary is that? What if you slip and fall? However, with a pole saw, you don’t have to move an inch from the ground. Pole saws comprise of a lightweight chainsaw attached at the end of a sturdy pole. You can then use this combination to trim the branches instead. Since you remain sure-footed on the ground, you are kept safe from falling branches. Learning how to use a pole saw is the first step in getting the best out of the tool you have just bought. When used inappropriately, even the best pole saw is of no meaningful value to you. Therefore, we will provide you with a step by step guide on how to use the pole saw for your trimming duties. The first mistake pole users make is assuming that they only need the pole saw for a successful operation. In as much it’s the most important one, some other essentials are just as important. Personal protective equipment is a must. At no time should you ever compromise on your safety for the sake of comfort. For this guide on how to use a pole saw, here are a couple of things you will need. Do not take a pole saw for granted as it is a dangerous tool. Before you do any cutting, you must first follow and observe safety procedures. Put on the safety equipment and clothing you had brought along. The goggles are meant to prevent wood chipping and splinters from the saw from getting into your eyes and obstructing your view. A hard hat/helmet will absorb the shock from falling branches that may hit you from above. A chainsaw glove acts as a vibration damping mechanism. Continued exposure to the pole saw vibrations causes finger defects. 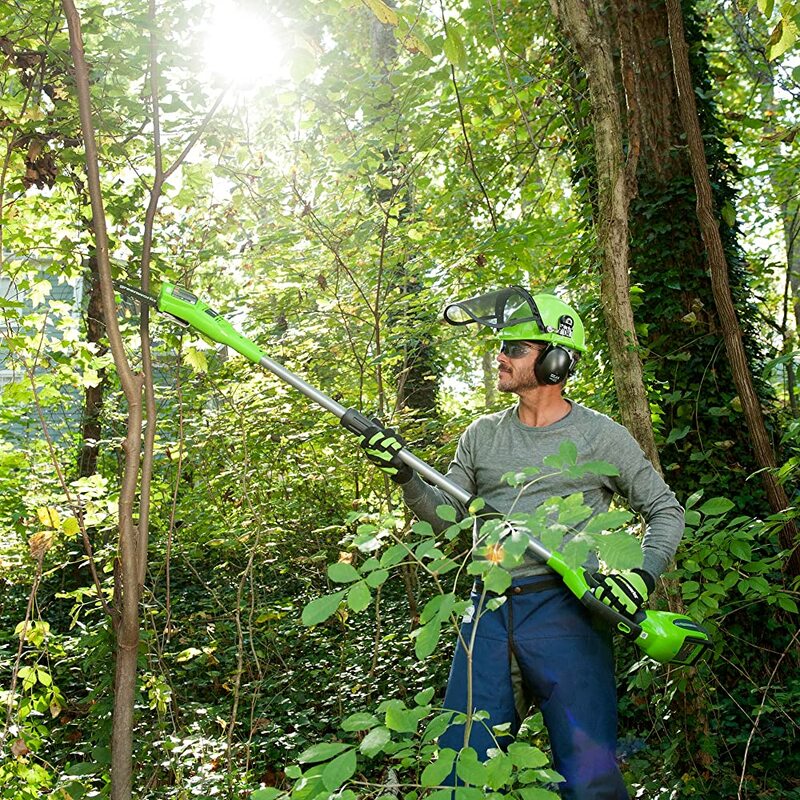 The PPE clothing keeps the rest of your body safe from falling vines and branches too. Once you start cutting the branches, there is bound to be lots of falling branches and vines. You do not want these branches and vines falling on your colleagues or power lines. You should not even work close to power lines in the first place. After clearing the area, cordon it off so that no one re-enters afterward. Importantly, get rid of any tripping hazards. It could be fallen branches, exposed roots or slippery grounds. Next, you need to do a risk assessment of the work site. Beware of access roads nearby, set up emergency procedures and try to figure out any potential scenario. Communicate all these with your workmates, if any. Hint: Have an exclusion zone with a radius of 15 meters around your working area. After putting on the protective gear and clearing your work site of any potential hazards, move on to the next step. This step is where you draw a plan of how you are going to carry out the process of pruning the branches. You should decide on which branches need to be cut first before figuring out those to be cut next. Most of the times, you will be required to make jump cuts on the branches to reduce their weight before making the final cuts. Since the branches are at different heights, you should have a rough idea of the total pole saw reach. This maximum reach always includes your height (and length of your hands to an extent). Never plan to cut branches that you will strain to reach. After you have determined the maximum feasible working height, extend the length of the pole to the desired reach. On most of the pole saws, you can do this by loosening its extension collar then pulling out the desired length. Once done, tighten the pole collar again to prevent it from collapsing back. To reduce the height, loosen the collar then push back the pole by the desired amount. When deciding on a length to use, remember that the longer it is, the harder it will be to maneuver it among the branches. After drawing the desired length, now move on to the next tricky part. First, start up the pole saw then use both of your hands to lift up the pole saw until it’s vertically raised. Then keep it raised so that you have it totally under control. Slowly, adjust the position of the saw to the limb you need to cut. Then let it rest on the limb for a while as you position yourself. As the saw rests, reposition yourself such that you are on the side of the brand you intend on cutting (do not be beneath it). Hold the pole saw with the handle at your chest level. Then adjust the height if need be so that you achieve the desired reach. This extension makes it possible to hold the pole saw at an angle to the limb you are cutting. Cutting the branches from the bottom upwards seems like the most logical thing to do. It ensures that you have unrestricted access to the upper branches which requires better maneuvering. Coupled with the fact that at full stretch the saw tends to be a lot heavier, it is a good strategy. When cutting any branch, it is good practice to angle the saw so that it is at right angles with the branch. This task will be easier if your pole saw’s working angle is adjustable. For heavy branches, make a jump cut from the less thin ends and work your way at intervals to the thicker parts near the trunk. While cutting perpendicularly to the branch, first cut a groove into the branch while ensuring that the saw takes as much bite off the branch as possible. It is this groove that will guide your subsequent cuts, even if done in different directions. After making the first groove on the branch, make an undercut on the branch. This undercut prevents the branch from tearing off the tree trunk at the branch collar when the top cut is deep enough. In this way, you will have succeeded in preventing any damage from occurring on the trees and eliminating flush cuts, branch stubs, and scars on your trees. If the saw tries to slip, simply gather back your composure for a moment and then proceed. After making the upper and undercuts, then continue to cut through the branches. Have the saw firmly secured in the upper groove and then increase the strokes. As gravity pulls the chainsaw downwards, it cuts further into the branch. Always be mindful of the branch you are cutting and change directions whenever necessary. As you change the direction, always maintain a working angle of less than 60 degrees at all times. It is imperative that you do not stand under any falling branch as that may spell the end of your pruning outing. Always retreat to safety as soon as the branch starts to fall. After trimming any of the branches, remove it from the working area. It could pose the risk of tripping you over when cutting the next branches. Continue this until you have trimmed all the branches that are reachable. Based on these pole saw reviews, it is evident that they have various lengths of pole mounted on them. These lengths vary from about 8 feet to 12 feet, being available in a series of step pieces. Ordinarily, a longer pole means that you can cut higher up while on the ground. The length, therefore, becomes a key consideration as the pole saw is meant for overhead cuts. However, the longer the length, the harder it is to control and maneuver the pole saw. You might then consider a height that balances reach and saw control. Another common feature these days is the inclusion of a telescopic pole. This feature is what would make the saw the best around. This is because having a telescopic pole means that the saw pole would occupy the least space in your garage during storage. Additionally, you could take into account your height when choosing the pole length to buy. The shorter you are, the more length you would need. The material which the pole is made of is a huge contributor to the overall pole saw weight. Therefore, the lighter the material is, the less heavy the saw is. The best material is aluminum as it is both super light and is also very strong to handle the weight of the saw at its top. The handle should also be made from comfortable materials that offer a good grip. Additionally, the pole diameter should be such that it allows a strong grip. Besides the pole length, this is another consideration that you might make. This length is a measure of the distance from the chainsaw front to the top of the cutting chain. It is this length that determines the thickness of branches that the saw can efficiently cut. Most saws have the 8” bar, while lengths of 6 to 12 inches can also be found. These provide you with options based on how thick the branches are in your yard. This relationship is such that the bar has to be longer than the branch diameter being cut. For example, cutting a 4” branch requires that the bar be at least 5” long for an effective cut. 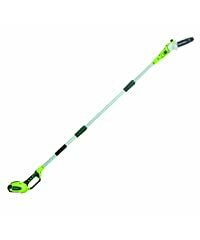 However, when you want a cordless pole saw, then the longer the bar, the faster the battery will drain and vice versa. As earlier mentioned, this is the first choice you will have to make. It could be either a manual, electric (corded), gas or a cordless pole saw. Each of these types of pole saws come with their own sets of pros and cons. You will have to make a compromise between the pros and cons of these saws. These are the most common types since they are the lightest and produce the least levels of noise. They need to stay connected to a power source, but with an extra power cord, you can extend their reach. They are known to provide the most powerful performance of all the pole saws. Heavy duty bars and chains are fitted to them so that you can cut through thicker and tougher branches. Their weight is an issue but they are well balanced. Also, be prepared to refill the tank with gas. Powered by either Lithium or Ni-Cad batteries, they provide decent portability with low noise levels. The only problem is that the battery will run out at some point. For an efficient cut and proper utilization of the power saw, you will have to keep the chain properly tensioned and sharpened. There are pole saws that will have an automatic tensioner, while others have the tensioner conveniently located. For lubrication, look for a type with an automatic oiler. It this way, you only top up the oil tank and the saw then self-lubricates. This design makes it easier in comparison to having to press a button to release the oil. Also, remember that the chain will require sharpening at regular intervals. By using a small-sized round file, you can do this yourself or have it done by a specialist/services. Versatility is always a good thing for a gardener. It enables you to use a single tool, albeit with attachments to accomplish various tasks. 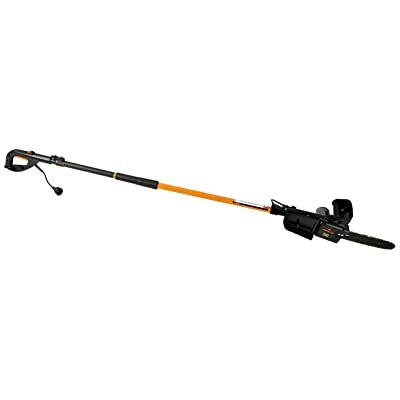 Look for a pole saw that you can easily turn into a hedge trimmer, a blower, an edger amongst a lot of others. When adding these attachments, consider the pole saw’s power outputs so that you don’t end up overwhelming it. The additional workload may shorten its life if it becomes too much. Pole saws always require that you put the pieces all together, unlike in the case of the telescopic shafts. The pieces might be two or three, depending on the types. You will be required to put the pieces together. Look for one that does not require any tool for assembly or disassembly. At times, you will have to perform low tree (surface) trimming. When performing such tasks, the parts will need to be removed and then attached back later. After you have invested in your lightweight and durable pole saw, you have to bear in mind that it might get damaged at one point or another. Or, it could be delivered while faulty and then you have to return it for a newer one. You, therefore, have to consider the type of warranty that the manufacturer extends to you as the buyer. This warranty is always an indicator of how well the manufacturer trusts their products. Therefore, the longer the warranty of the pole saw, the better for you. You also have to have to put into consideration how much it will cost you to repair the pole saw if it gets damaged in comparison to buying a new one. In such cases, if the maker guarantees the repair of the saw if it gets damaged and it’s not your fault, the better for you. The pole saw that you choose needs to have certain extra features above the usual ones. These are what make the best pole saws stand out. Take for instance, a telescopic pole. This feature enables you to adjust the height to your preferred position and even work on the surface. The chain and bar should also auto lubricate, while handles that feature anti-vibration properties are a big plus for you. You will be able to work for longer hours without feeling fatigue, especially for gas pole saws. Lest you forget, you will be holding the pole saw in a raised position. This makes weight a more important considering when buying these pole saws. A lighter pole saw would be much easier to maneuver than a heavier one. Just ensure that the weight does not compromise on its power. After pruning the highest branches, spanning over 6 feet, you, therefore, need to store the pole saw for another day’s work. Before you go for the longest pole, ensure you have the required amount of storage space that will accommodate all the poles and extensions. If you are low on space, then we suggest going for a telescopic pole, for accommodation. After work, the pole can be collapsed all together then easily stored. Pole saws are available in cheap, moderate and expensive alternatives. You, therefore, have to consider your available budget before making a choice carefully. Having this in mind, you don’t have to pay premium prices so that you get the best pole saw. Manual pole saws and corded pole saws should be available for the affordable cost. Other high-grade alternatives are available if you need them. For premium options, the gas-powered ones could be available for the more expensive price. One thing is for sure. A pole saw, just like any other chainsaw is a very dangerous tool when mishandled. When coupled with the fact that you will be working on elevated wood, it does not make your work any easier. In such conditions, it is therefore imperative that you take your safety very seriously. It could mean the difference between pruning tree branches and “pruning” one of your limbs. Here are some of the safety tips you should always have in mind before you start using the pole saw. Most of you do not bother to go through the manual that comes with their brand-new pole saws. I used not to go through it too and always wondered what reason I could give if all those mishaps and malfunctions happened to me. Spare a few minutes of your time and check out what the saw specifications are, its limits, handling procedures and the “do” and “don’t.” It is also the best way of knowing the best pole saw handling techniques. This step will make a huge difference to your safety levels and user experience. Various pole saws will reach different overhead heights. And although some of you will prefer the longest pole out there, watch this height. In simple terms, the higher the pole saw goes, the heavier and harder to maneuver it becomes. Everybody loves a powerful tool. However, they are great up to some points beyond which they then become a problem to deal with. One of the biggest problems with a gas pole saw is the issue of chain kickback. When the blade jams inside a branch being cut, the motor power starts to kickback due to the high strain being imposed on it. This power may spin the pole saw from your hands if you do not anticipate it. To be safe, cut thick branches is small progressions and be aware of any potential chain push back. Look here; stop taking shortcuts when working with any machinery. I hear some of you say that protectives make you uncomfortable as you work. Isn’t that just so unfortunate? When working using a pole saw, a hard hat or chainsaw helmet, chainsaw gloves, ear protectives and safety glasses are always recommended. While working, avoid any loose clothes on you. The danger associated with power lines must be well known to everyone. With all this knowledge, some of you might want to trim your trees that are near or overhanging on these power lines. Do not attempt any such works as you may put your life and those around you at risk. When trimming trees, there is bound to be falling branches. First of all, you need to have a plan and alert those around to know what you will be doing. You do not want any surprises that may come as you work such as someone passing by when a branch is dropping. If possible, try to have someone helping you out. You also need to work out how the branches are intertwined so that you have an easier task of pruning them. Always have no children and pets in your working area at all times. Then try to figure out the fall patterns of the limbs and clear those areas of anything that could be harmed. When trimming hard to reach branches, you are bound to tire after a while, even when using electric pole saws (they are the lightest). At heights of more than 8 feet, you need regular stops so that your body recuperates. Incidents increase when you become too fatigued and exhausted. To prevent any slip-ups as you trim, check where you will be standing on to ensure it is not wet and slippery. Otherwise, you may slip, and fall with the pole saw tumbling onto you in the process. If you might be using a ladder, then this becomes more important. First of all, never stand directly underneath the branch you are cutting. That is a recipe for disaster. Then, cut the branch into sections as opposed to cutting the whole of it at once. Making an undercut before cutting the limb helps prevent the bark from tearing back into the tree trunk. When that happens, it is kept from falling and may damage the bar and chain in the process. You need to keep your machine working at optimum levels at all times. This is if you want to complete your jobs on time and move to the next. Whether it is a battery, electric, manual or gas pole saw, you have to maintain and service if for proper functionality. However, if you own a gas pole saw then you will have to do more work since electric and cordless pole saws require very little maintenance. All pole saws need the chain to be lubricated at all times when running. Before you start working, check the oil level indicator and top up the oil level accordingly. Do not overfill the oil reservoir as the oil will leak when held up. Check the user manual for the right type of oil to use. If the saw has a button that you have to press to squirt out the lubricant onto the chain, then always remember to do so. This way, you would be prolonging its lifespan. With time, the chain is bound to either tighten or become too loose on the chain bar. You need to familiarize yourself with how to adjust this tension as the features are always provided. Always check the chain to ensure that it is front facing, and not the other way. On a daily basis after use, ensure you clean the saw and remove the wood chippings and any debris before storing it. Remove the protective cover and clean it too. Sharpening of the chain should only be done if you are sure of how it’s done. Otherwise, find someone else to do it for you. Use a round file that is small enough to fit in between the chain teeth. Remember to tilt it at the right angle. Oil and gas leaks are a common occurrence in pole saws and chainsaws as well. Always check to ensure yours does not have any of these, and if it does, then repair the leak as soon as possible. Due to the constant vibrations, some of the parts are bound to get loose after a while. Nuts, bolts, and screws have to be tightened at all times. This is the only way of ensuring the chain will not pick them up. It is not always possible to carry out all of the maintenance work at once. A way of working around the problem is to schedule different maintenance works either weekly or monthly. Here is an example of what you could do. This requires that you disassemble the pole saw to some extent. You should, therefore, be well conversant with how to go about disassembling your pole saw. Have a look at the stop switch, throttle, and its trigger lock to ensure they are in top conditions and are functioning well. You can as well clean the air filters and the carburetor (for gas pole saws). Get rid of all the debris that could be blocking the airways. The starter cord, starter and return spring have to be checked to ascertain that they are flawless. Don’t forget the vibration dampening system. Remove the spark plug and check for any damages on it. Replace it if necessary. While at it, give the fuel filter some attention. Clean all the dirt that is on it and then replace it back. Other parts that you will need to work on include the fan wheel, fuel tank, carburetor, and wiring. A pole saw is an integral tool in the garden care line of tools. It enables you to keep those tree branches in check so that they don’t overwhelm you in autumn with leaves and birds. You are then able to trim them as you remain standing on the ground, hence assured safety. In this pole saw the review, our favorite pole saws are the Remington Electric Pole Saw and the Gas Pole Saw, Maxtra 42.7CC 2-Cycle. These two are the electric pole saws and gas pole saw category which is the most common pole saw types. Of the two, the Remington is our top pick because of its impressive performance figures and being a two in one garden tool. 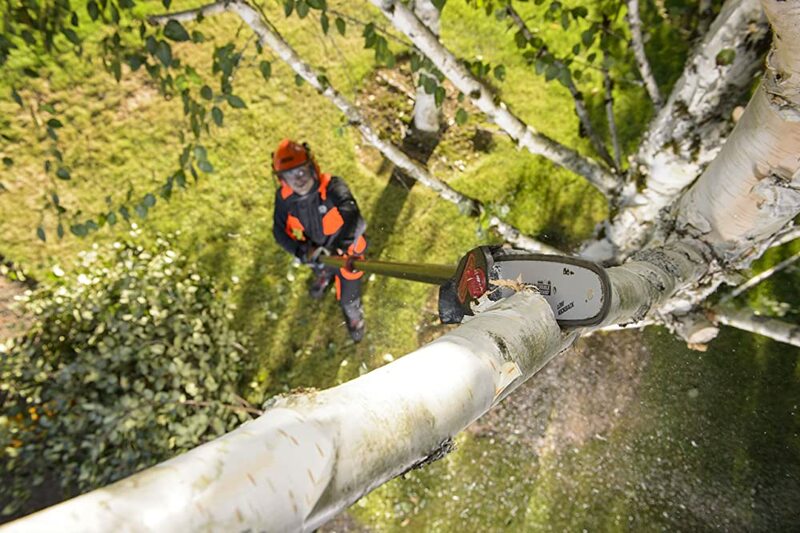 It converts from a pole saw to an electric chainsaw by simply removing the pole. With an overhead reach of about 15 feet, it is among the products with the highest maximum reach, although user heights play a great role in that. A 10-inch bar and chain make it possible to trim even the thicker branches as shown in the previous section. The pole is made of aluminum which is a light and strong material. This greatly reduces the weight of the pole saw while also making the pole durable. The handle is made of non-slip easy to grip handle for extended uses.